BTW, I did look at the cars…A LOT OF CARS, at the Chicago Auto Show. The crowds were exceptionally good for people watching on opening day. My cameras did a fine job of capturing many of the beautiful humans enjoying the show. You wear a shirt like that and I consider it my civic duty to help you flaunt them. 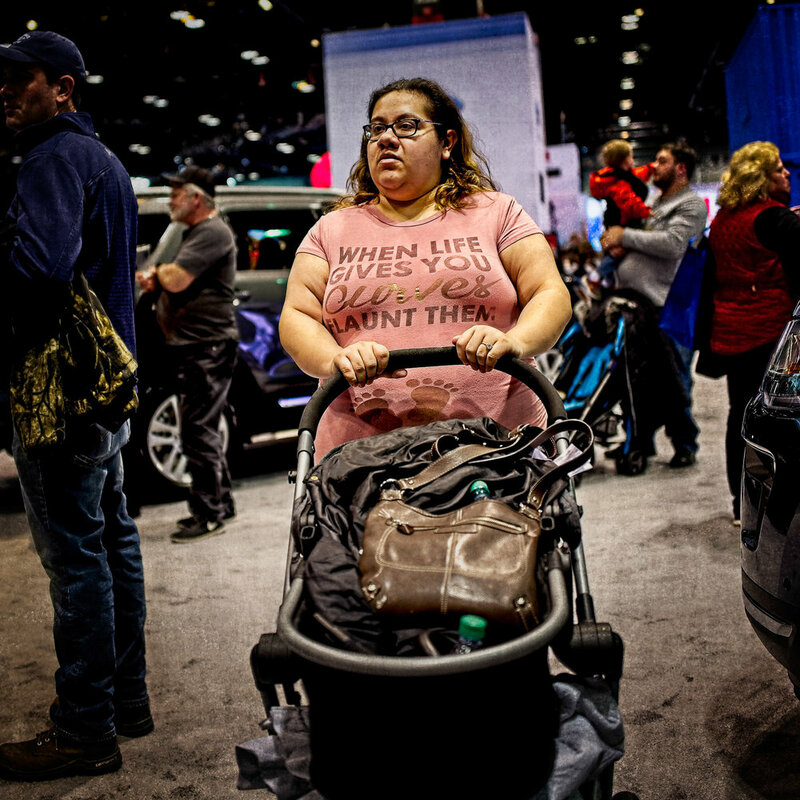 It was obvious observing you that you were having a blast at the Chicago Auto Show. Bravo! I applaud you and your joyful nature. Nothing spectacular. Just having fun playing around the SCUBA gear with my Leica QP. I am loving this little camera!. I shoot RAW+JPG. I use the monochrome JPG setting. The JPGs never need adjusting. I crop them a bit here and there and that’s about it. The colors are great too. I just love the Leica black and white. There are fun shots just about everywhere, especially where you find people! The camera found some interesting stuff while I was roaming around a local cemetery. A 50 Year Old Bucket List Item! It’s been almost 50 years ago! It was 1969. I was a 16 year old kid standing in a camera store in Nairobi, Kenya, with my own money, buying my first camera. I had used my dad’s Yashica-Mat 124g and Nikkormat for a couple years. I got the photography bug…from concept to all the darkroom stuff. There weren’t m(any) places to get your photos processed out on the plains bordering the Maasai Mara where we lived. We had a closet that doubled as a dark room. When in use the chemicals stunk up the tiny house in which we lived. That was such a memorable day. I could take you to the spot today, assuming it’s still there, around the corner from the New Stanley Hotel. I knew I was getting the beautiful black Nikkormat and the 50mm f/1.4 lens. It’s what I was familiar with. However, I had to at least put a legendary Leica in my hands, hold it, feel it, touch it. I admit, I may have fondled it just a little bit. I was a kid. Don’t judge me! The Leica just wasn’t in my price range. I knew it was a stretch but hoped that one day I would have one. New Years Day 2019 was the day! I am fortunate and grateful to have not had to work for several years. 1/1/2019 was a special day. Late in 2018 I turned 65. I set up my pension payments to begin on 1/1/2019. Officially retired. My wonderful husband was not going to let that slip by unnoticed. His generous, loving thoughtfulness has struck again. So, nearly 50 years after having drooled just a bit over that now ancient Leica in Nairobi, I am the proud owner of the amazing Leica Q-P! I must say, it was worth the wait. And, my dear Albert, WAY BETTER than expected, WAY BETTER than a party…a 50 year bucket list item! Your love and thoughtfulness has no limit. I still find it hard to believe you picked me. Thank you for a wonderful life. I intend to play with the Leica over the next few days. There will be some “not very pretty” images as I play around with the new camera. It has to be done. I love the Fuji’s. Not a big secret that I’ve become a Fuji fanboy after selling my 20 years of Canon accumulation a couple years ago. I’m getting old. I’m tired of lugging the heavy stuff around. I hope my Fujis don’t get their feelings hurt! I'm just a guy with a photography hobby. Some of my favorites are in my galleries.